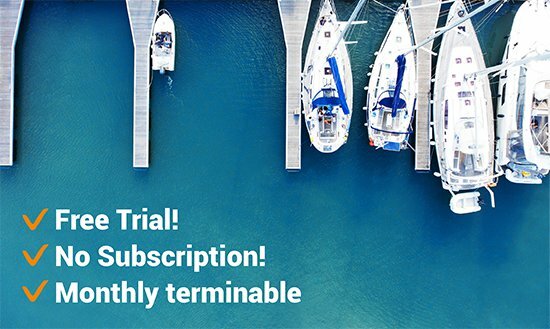 2 months free trial: List your boat for 2 months on Boats24.com, completely free of charge, to test our strong customer base! 7 languages: Our website exists in German, English, French, Spanish, Italian, Polish & Dutch. The automatic translation of your ads increases your reach. 50 million page impressions: We counted 50,000,000 page impressions in the past financial year. In this variety of potential boat-buyers may be one of your future customers waiting. 10,000 Top Google Rankings: We are best-ranked at variously search queries. Monthly and summarily terminable: You don’t have to make a commitment for a longer period of time. If you want to cancel the collaboration with Boats24.com, it’s possible within the same month and won’t cause additional costs. Optimal representation on every terminal device: Due to our responsive designed website, it’s possible to reach your prospective customers on their computer, notebook, tablet and smartphone without any difficulties. XML- Interface: Our connection to other providers. Due to this connection, you won’t have to enter the information about your boat at several websites. If you advertise on other providers’ websites, you can use it to copy the information about your boat to Boats24.com. It also helps to keep your advertises up to date, because it’s possible to refresh your information, if desired. Inlineframe on your Website: We offer an inlineframe as an additional service. By this it is possible for you to integrate your advertises at Boats24.com on your own website. Your ads can be sorted by category, producer or for example by “special offer”. Your own Dealer Website: Your dealer page provides links to your boats advertised on Boats24.com, as well as directions and a photo of your company! Convenient & Practical Database: Every customer is entitled to a personal username and password for their own private login area, where advertisements, prices and photos may be uploaded or edited at any time. Up to ten photos and two A4 pages of descriptions may be published. Free of Charge Statistics Service: If requested, we will gladly send a free weekly overview of all of the views and enquiries your boats have received. Profit from our cooperation with Axel Springer and get your advertisement printed in the WELT am Sonntag newspapers. You may order image or text listings that will appear on Sundays (in WELT AM SONNTAG), appearing alongside well-informed editorial articles. If you were to register on the 14th of a given month and list 18 boats on the 15th, on the 1st day of the following month we will work out that the average number of boats listed in the preceding month was 9. This number of 9 boats falls in the 1-10 category. Therefore, you will receive your monthly invoice (via E-Mail) for the amount of €49.00. In the following month, if you still have 18 boats listed, your invoice will amount to €89.00. Please do not hesitate to send us an E-Mail to info boot24.com or call us on 0049 (0) 40 244 249-27.